In 1562, when France was torn by religious strife, Guspard De Coligny, admiral of France, sent two vessels to the New World in search of a refuge for the oppressed Huguenots. Leading the expedition was the Huguenot explorer, Jean Ribault, who charted a new course across the Atlantic and arrived off the coast of Florida. On Friday, May 1, 1562, Ribault's party landed in the New World here on the east shore of Xalvis Island in the presence of friendly Indians. The Frenchman fell to the ground and gave thanks to God in the first Protestant worship service held in the New World. Ribault sailed on up the coast where he founded the colonial settlement of Charlesfort - named in honor of his King. Charlesfort didn't last; and in 1562, a new Huguenot settlement - Fort Caroline, was established on the St. John's River. There, sometime before 1565, the first Protestant white child was born in what is now the United States. On his second voyage to the Americas in 1565, Ribault and his men were shipwrecked near St. Augustine. The bold explorer and most of his followers were cold bloodedly murdered at Matanzas Inlet near St. Augustine by Spanish Governor, Pedro Menendez, who feared the encroachment of France on Spain's Florida Empire. Huguenot Memorial Park, is a 450 acre linear horseshoe shaped peninsula, which three bodies of water surround: the Fort George Inlet, St. Johns River, and the Atlantic Ocean. 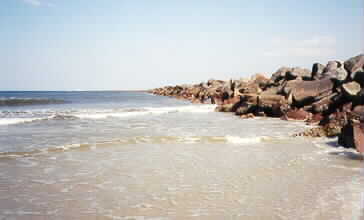 The park is also referred to as the BIG JETTIES or NORTH JETTIES. These names come from the fact that the park offers access to the JETTY ROCKS used to guide ships into the mouth of the St. John's River. Approximately one mile of these rocks are accessible to the public for fishing. Other amenities offered by the park are camping, surfing, windsurfing, birdwatching, driving on the beach (in designated areas), viewing of the Mayport Naval Ships and much more. 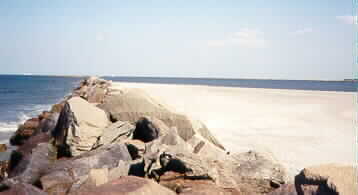 Huguenot Park also plays a big part in the conservation area. They have and maintain a BIRD SANCTUARY that is a fertile nesting site for many abundant sea birds that call Huguenot Park home. It is also home to lots of different wildlife; from raccoons, opossums, and foxes to many endangered marine animals, such as turtles, manatee, and dolphins. There are also environmentally sensitive Coastal Tidal Marshes and a primary Dune System. Camping registration is from 8 a.m. until 10 p.m. ONLY. Quiet hours for campers are between the hours of 10 p.m. until 6 a.m. CAMP SITE VISITOR PASSES are available. All registered visitors of campers may enter the park until 9:30 and leave no later than 10 p.m.
Reservations may be made by phone. Visa and Mastercard are accepted and your card will be charged at the time the reservation is made. Cancellations must be made 24 HOURS IN ADVANCE. There is a NO REFUND policy but you will receive a CREDIT that is good for a year. The camp sites are primitive (no hook-ups) but this is off set by the NATURAL BEAUTY of Huguenot Park. In the summer months, a Bait Shop and Concessionaries are open to make your visit more enjoyable. Due to the many bodies of water, LIFEGUARDS ARE NOT ON DUTY AND SWIMMING IS AT YOUR OWN RISK! However, there are two JSO Police Officers assigned to the Park as well as a Jacksonville Police Stop Station on the premises to ensure a safe visit for all. You may also E-MAIL ME! I would be happy to answer your questions, if I can.